"Well I've done some foolish things in my time, but this takes the whole biscuit." The fourth season of The Andy Griffith Show continues to deliver its classic, high quality entertainment, with another 32 outstanding episodes. The series thrives on the relationships between Andy and his fellow cast members, sometimes touching, always hilarious. The writing in this show is superb, giving its equally talented cast a chance to shine at every turn. While the team of Griffith and Don Knotts is always good for a laugh, the chemistry between Andy and his young costar, Ron Howard, really gives depth to their characters. The season opens with a fan favorite, Opie, Birdman in which the young Taylor learns a valuable life lesson after accidentally killing a mother bird with his slingshot, and adopting her chicks. Howard is exceptional in this one. Opie continues to challenge his father, when he and his friends are persuaded by a drifter to adopt the methods of their play time hero in Opie and his Merry Men, then Opie gets jealous when his father adorns attention on his new friend. Andy's elation at a perfect report card causes Opie distress when the boy finds out his teacher made a mistake in Opie's Ill-Gotten Gain, then A Deal is a Deal when Barney and Gomer step in to help the boys after they are conned in a miracle ointment sales scam, with predictably disasterous results. For Gomer Pyle fans, this season is the one that would make Jim Nabors a true regular on the show, but his presence was short lived as he moved to the spin-off, Gomer Pyle, U.S.M.C., whose series pilot closes this set. Gomer is featured in a number of episodes; Gomer the House Guest finds him fired from the service station and therefore homeless, so Andy makes the unwise, but charitable, decision to let him move into the Taylor household. Barney is up to his old matchmaking tricks in A Date for Gomer, trying to set him up with Thelma Lou's somewhat homely cousin. Nabors' vocal talents are showcased in The Song Festers where Barney's ego takes it on the chin when the town choirmaster chooses Gomer to replace Barney as soloist for their upcoming concert. Here we see a more sensitive side to Gomer's typically bungling character as he recognizes how hurt his friend is by the move. When Andy Saves Gomer from a small fire at the filling station, Gomer's appreciation becomes overwhelming, forcing Andy to find a way to make things even. Perhaps the most memorable is Citizen's Arrest in which Barney's issuance of a traffic violation escalates into an all out war between he and Gomer. With Gomer's character leaving, his long talked about cousin Goober makes his first, albeit brief, appearance in Fun Girls which finds Andy and Barney in the doghouse when Thelma Lou and Helen see them escorting gals from another town. As usual, partner Barney is set to test Andy's patience, and this season has some classic Fife episodes. In The Haunted House, Barney has to prove that there are no such things as ghosts. Then, it's A Black Day for Mayberry when the sheriff's department is hired to guard a covert gold shipment, but Barney opens his big mouth, which also gets him in trouble with his landlady, leading to his eviction in Up in Barney's Room. With his brittle ego, Barney is destined to be town hero when Andy and Helen get trapped in Barney and the Cave Rescue. Deputy Fife is on a mission to curb the rampant crime occuring on the highways around Mayberry when he picks up a motorcycle at auction and sets up a speed trap in Barney's Sidecar, then he goes on a stakeout while looking for The Shoplifters who are robbing Ben Weaver's store. The sound of wedding bells can't be too far off for Andy and Helen, at least according to Barney, after he spies the pair in the jewelry store and puts one and one together (The Rumour), then he finds himself in hot water after a smug remark in Barney and Thelma Lou, Phfftt. 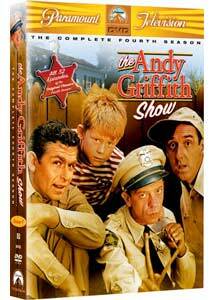 Back to Nature tests Barney's skills as an outdoorsman, when he, Andy and Gomer take the boys out for a camping trip. Aunt Bee comes to the cause in Aunt Bee the Crusader when she learns her friend is about to be evicted, then she finds out that a deal is not always a deal when she gets a bargain on a freezer load full of beef, only to learn the appliance has other plans (Bargain Day). Otis becomes a concern when he buys himself a car in Hot Rod Otis. A number of characters seen previously make their return here. The Darlings appear in a pair of episodes, the first of which finds the elder Darling (Denver Pyle) in a courtin' mood, when Brisco Declares for Aunt Bee, then Andy finds himself in a pickle when Charlene (Margaret Ann Peterson) is looking for Divorce�Mountain Style, with the sheriff as her new intended. Meanwhile, her former suitor, Ernest T. Bass, is back and causing trouble in Mayberry. Figuring his lack of luck with the ladies is that they are looking for a man in uniform, Ernest T. Bass Joins the Army, but when that fails, Andy and Barney have a little wager that Mr. Bass can be reformed in My Fair Ernest. The Return of Malcolm Merryweather finds Bernard Fox returning as the trusty manservant, this time hired by Andy to take a load off the busy Aunt Bee. It's hard to pick favorites with so many brilliant episodes, and this cast gets top marks for their chemistry. It's no wonder that this show has maintained its popularity over the years, and with each DVD release, new audiences can discover the magic that The Andy Griffith Show has to deliver. Image Transfer Review: Overall, image quality continues to be excellent, meeting or exceeding that of previous seasons. Greyscale is well rendered, blacks are solid and detail level is very good. Due to varying sources�which aren't nearly as obvious as some prior seasons�there is some slight difference in the quality, and certain areas exhibit more wear or have minor defects (streaking, debris, softness or contrast issues) than the rest which is predominantly pretty clean. Audio Transfer Review: Mono audio continues to be strong and well balanced, with only a smidgen of background hiss evident in quieter passages. Distortion or other anomalies are next to nonexistent. The only real issue here is the lack of a laugh track on four episodes: Opie The Birdman, A Black Day For Mayberry, Opie's Ill-Gotten Gain, and Up In Barney's Room. Extras Review: There are no extras other than trailers for The Brady Bunch, MacGyver and Charmed, which can be found on the first disc, and which Paramount has thankfully made easy to skip. The disc packaging is in line with previous seasons, with the five DVDs housed in thinpaks inside an outer box. As the only season to regularly feature fan favorite, Gomer Pyle, this fourth year of The Andy Griffith Show packs a lot of entertainment, and plenty of classic episodes into these 32 installments. Despite a lack of extras, Paramount continues to deliver the goods in the transfers department, which adds to the enjoyment factor considerably. It's go-ood!